Compare prices from several car hire companies in Seville Airport and find the best price for car rental. Our prices always include unlimited mileage and insurance. 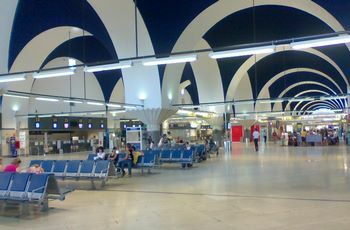 The airport is connected to the city of Seville, going under the name Seville Airport or San Pablo Airport (SVQ). The airport is located about 10 km northwest of Seville, and it takes between 20 and 30 minutes driving distance between the city and the airport. There are five different car rental companies here, and taxi stands outside the arrival hall. Buses run every half hour. In 2010 Seville Airport handled over 4,000,000 passengers, an increase of approx. 1 million since 2005.Airlines EasyJet, Air Berlin and Ryanair offer flights to, among other things, Palma de Majorca, London, Marrakech and Pisa. There are a wide variety of shops at the airport, which jewelry store, sports shop and convenience store. In addition, a duty-free shop, pharmacy, post office and restaurants which tapas restaurant.